Coverage: Jumping test, BBC Two, 10 May at 14:00 BST. 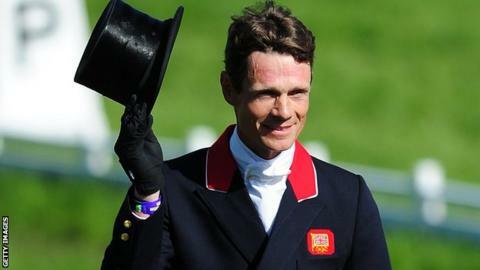 Olympic silver medallist William Fox-Pitt remains in contention for a second Badminton Horse Trials title heading into Sunday's jumping test. The 46-year-old, who won in 2004 on Tamarillo, is second on Chilli Morning, behind New Zealander Andrew Nicholson's Nereo, after the cross country. Oliver Townend is third behind fellow Briton Fox-Pitt but Nicholson, 53, will secure a ninth top-level title with a clear round of jumping. "You had to nail it," said Fox-Pitt. "You couldn't afford any mistakes or any seconds over the time." The top five combinations after dressage retained their positions following the cross country. There were 13 clear rounds inside the time and less than five penalties separate the top six, but Briton Tina Cook, riding De Novo News, was among 10 eliminations. Townend - in 2009 - was the last home rider to win the event. Sunday's finale is live on BBC Two from 14:00 BST.